IT conservations: Are there Fictitious IP addresses? Are there Fictitious IP addresses? 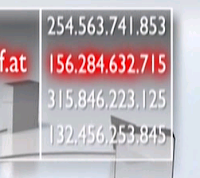 A recent rant from a friend of mine about the utterly wrong representation of IP addresses in a science/tech show on Austria public TV (ORF) made me think. What worries Martin, is that they use internet addresses like 156.284.632.715, which are obviously fake, because the are not made of 4 8bit values (octets). I really like to defend the ORF in this case: as with car license plates or telephone numbers, it could be considered a breach of privacy to pick one that exists for real. So you have to revert to numbers that do not exist in reality. The US, for example, have reserved the part of exchange code 555 for such fictitious telephone numbers, meaning that you can pick any 555-xxxx number without running the risk of bothering anyone or being sued over it. Not sure how it is done with license plates, but since they tend to be centrally registered, I guess there is a range of numbers that can freely be used in fiction. However, with IPv4 addresses being on short supply anyway, one would have to revert to IP addresses that 100% cannot by owned by anyone (else), like 127.0.0.1 oder 192.168.x.y. You would be kind of safe from a legal perspective, but nor from Martin's rants. Had the ORF shown 127.0.0.1 or 192.168.1.1 to actually be resolved through DNS, Martin would still have ranted about it. Not because the IP address is wrong, but rather because the name used would never be resolved to this address. So, Martin, this is an OK use of "wrong" or rather "fictitious" internet addresses, not an "Epic Fail" as you say. I very rarely do so. I beg to differ on the IP issue though. IP addresses are, at least those of well know public web servers, not a "privacy" issue. If publishing an IP address would be a "breach of privacy", every DNS server operator would be guilty of that. Therefore, they could easily have used real ones (ORF, W3C, ICANN, ...). And if they, as they should have, resort to IP adresses allocated in RFC 1918 "Address Allocation for Private Internets" (19.168.,x.x, etc. ), they should also have used "example.com" as specified in RFC 2606 "Reserved Top Level DNS Names". Martin, points well taken, but this still does not make it an "Epic Fail". 4G - Which is it?